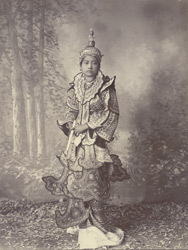 originated at the royal court and were based on royal dress, it is possible that she may be a dancing girl. The photograph is from an album devoted almost entirely to Lord Elgin's Burma tour of November to December 1898. Victor Alexander Bruce (1849-1917), ninth Earl of Elgin and 13th Earl of Kincardine, served as Viceroy of India between 1894 and 1899.